- Launch digital marketing campaigns as well as optimise their efficiencies on advertisement channel e.g. Facebook, Google, Adnetwork, etc. - Create and translate content copywriting for advertisement and landing pages. - Research for new product opportunities and analyse trends. - Conduct market research to find potential customers and suitable product to be produced. - Discover new marketing techniques. - Develop new process to increase efficiency. - Reporting directly to marketing team leader and manager. - Sales, Customer Service Centre, Payment and other related departments. - Fluent in Thai and English. - Bachelor's degree. Degree in Marketing, Business or IT-related is a plus. 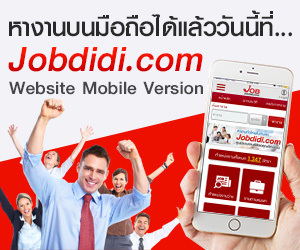 - Prioritise candidates from Chulalongkorn, Thammasat, Kasetsart and Mahidol universities. Staffs from these uni have proven to be more successful within my department at the moment. - 0-3 years experiences in digital marketing or copywriting is a plus. - Have some background about online marketing is a plus." - Result oriented, Problem-solving, Logical thinking.